CALUMET — Animal-assisted therapy is gaining popularity — and value — across the country. According the Mayo Clinic, Pet therapy is gaining fans in health care and beyond. Pet therapy is a broad term that includes animal-assisted therapy and other animal-assisted activities, Mayo Clinic states. It is a growing field using dogs or other animals in helping people to recover from, or better cope with, health problems such as heart disease, mental health disorders, and even cancer. Pet therapy is also finding value in non-medical settings such as universities and community programs, to help people deal with anxiety and stress, Mayo states. According to UCLA Health, which published findings dating back to 2005, animal therapy has benefits beyond what anyone had initially hoped. Researchers discovered that a 12-minute visit with a dog helped heart and lung function by lowering blood pressures, diminishing release of harmful hormones and decreasing anxiety among hospitalized heart failure patients. Benefits exceeded those that resulted from a visit with a human volunteer or from being left alone, UCLA states. The therapy is instrumental in treating mental health patients. Humans interacting with animals have found that petting the animal promoted the release of serotonin, prolactin and oxytocin – all hormones that can play a part in elevating moods. It also lowers anxiety and helps people relax, provides comfort, reduces loneliness, increases mental stimulation, and other benefits too numerous to list here. Locally, pet therapy is being used at Aspirus Keweenaw in Calumet, where Roland and Gloria McKinstry of Calumet are affiliated with Superior Land Pet Partners (SLPP), a local affiliate of Pet Partners Therapy Animal Group, which trains, tests and registers animal therapy volunteers. 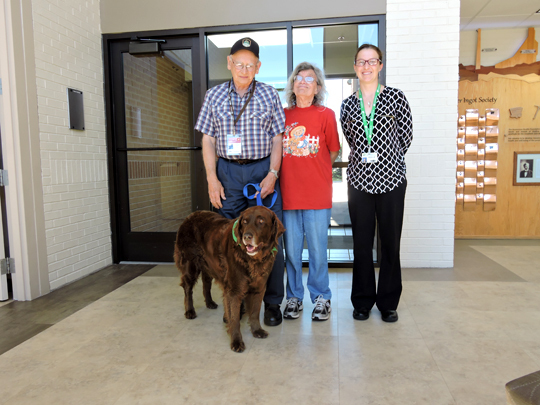 The McKinstrys, along with Bowser, their Chocolate Lab and Golden Retriever mix, are animal therapy volunteers at Aspirus Keweenaw. They accepted the donation of $548 from the Aspirus Keweenaw Health Foundation, accepting it on behalf of Superior Land Pet Partners (SLPP), a local affiliate of Pet Partners Therapy Animal Group, which trains, tests and registers animal therapy volunteers. Bowser and Roland McKinstry started making visits to Aspirus in January. The reactions from both patients and staff have been overwhelmingly positive. McKinstry said he and Bowser were recently visiting a nursing home where someone had come to see a loved one, and saw Bowser. McKinstry said that as the importance of animal therapy is becoming better understood, and more widely accepted, it is rapidly gaining popularity in the Copper Country. But, what is involved in training the dog, or the dog’s handler? During the class, participants study what to do, and an instructor demonstrates with a dog, to illustrate the lessons. After the class, the handler then practices what he or she has learned on their own dog, McKinstry said. SLPP is hosting a handler class at Aspirus Keweenaw Hospital in Laurium on Sat. July 21, from 8 a.m. – 4 p.m.. The class, which will take place in conference rooms 1 and 2, is the first step toward becoming a registered pet therapy team with Pet Partners. For more information and to register for the class, please call Patty at (906) 204-2218. for information on animal therapy, or becoming a registered pet therapist, visit petpartners.org.